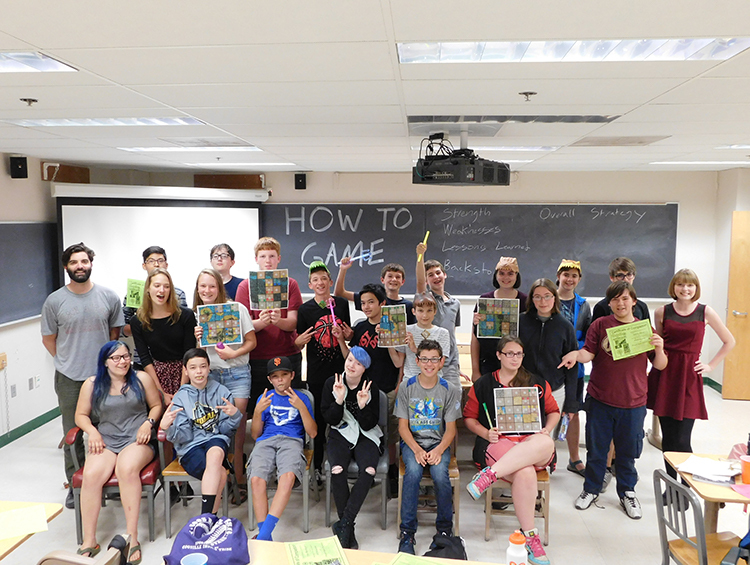 High school students gave the first ever Bioenergy Camp a thumbs up, thanks in large part to a strategy-style board game piloted at the Oregon State University camp. Play was the key ingredient to the success of the Bioenergy Summer Camp held at Oregon State University (OSU) July 18-22. Twenty-one high school students (mostly 9-10th graders from Corvallis, Newport, and Lebanon, OR areas) participated in the camp. It was the first of its kind, and a collaborative effort between OSU’s Bioenergy Education Initiative (BEI) and STEM Academy. OSU is AHB’s partner leading the K-12 bioenergy education portion of the project. The camp organizers took a unique approach to the camp, blending a series of short energy-related lectures, hands-on activities, and a strategy-style board game. A wide range of bioenergy topics were covered including photosynthesis and biomass conversions into liquid fuels and electrical energy. The camp also stressed the need to create sustainable solutions for the long term health of communities. Students applied this information to the board game, Planet 1061, which gave them an opportunity to process the material they learned in a creative and meaningful way. Each day at camp covered a different energy concept. Related activities helped students understand these concepts. For example, the rocket pictured here is part of a squishy circuit lesson. 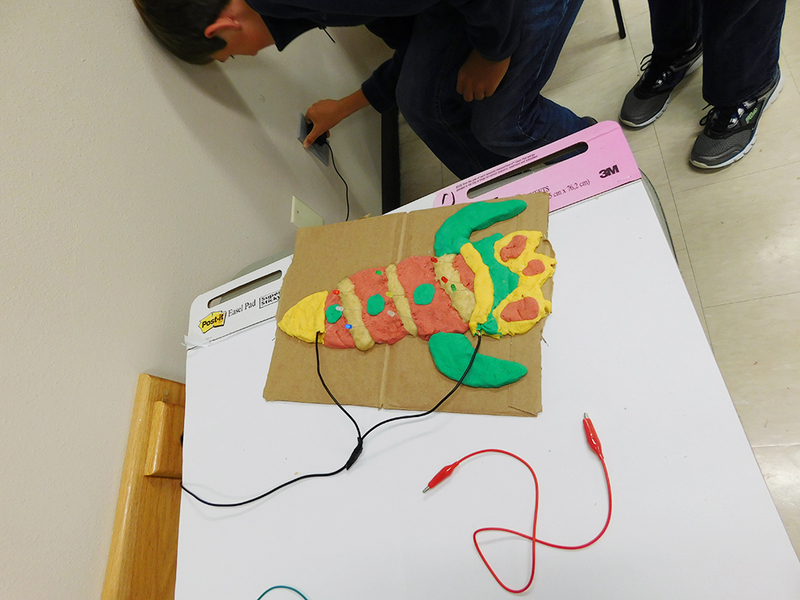 Students made sculptures out of differently charged dough then tried to power LED lights inside the sculptures. The activity demonstrated how parallel and series circuit connections work. 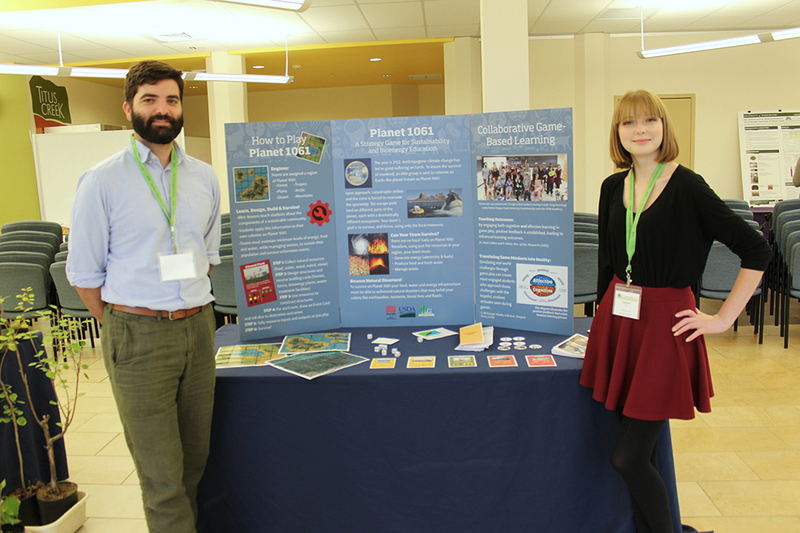 OSU graduate student Keaton Lesnik and undergraduate Stephanie Pettro present the game during the AHB Annual Meeting 2016 at Walla Walla Community College. The name of the game, Planet 1061, is a reference to the potentially habitable planet orbiting a star called Wolf 1061. The premise of the game is that Earth’s environment has dramatically changed due to the effects of climate change. The players are part of an elite group who voyage to a distant planet that can sustain life. Disaster strikes as they reach the new planet, and they must escape in shuttles. Unfortunately, the shuttles land on different parts of the planet, each with very different ecosystems. There are no fossil fuels available anywhere on the planet. 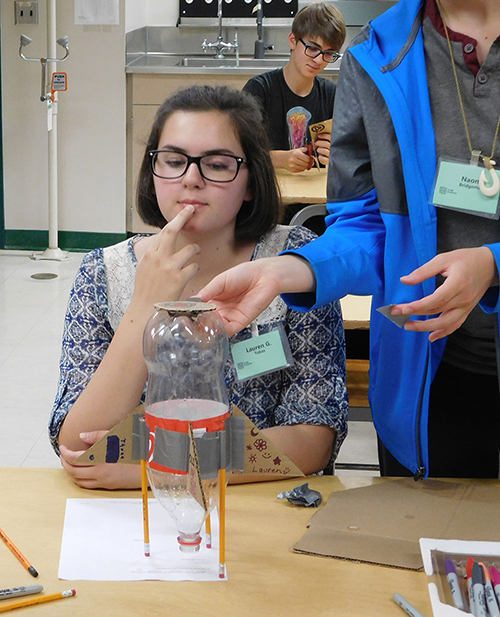 High school student, Lauren G. from Newport, contemplates her team’s rocket design. With this backstory setup, students are broken into teams and assigned a region of Planet 1061 (desert, mountains, plains, tropics, arctic, or forest). Their first task is to discover the resources available in their region. Then the teams must determine how these resources can be used to provide food, shelter, and energy for their new community. 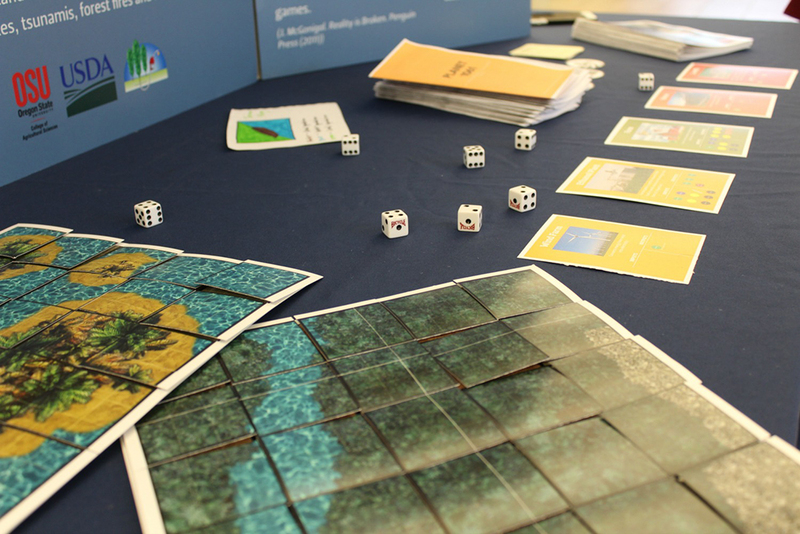 As students play the game and build their communities, they select Happening Cards which often deliver natural disasters and threaten the new communities’ survival. Planet 1061 uses gameboards, cards, and other pieces. Happening cards and dice are used to simulate uncertainty. “Students fully embraced the challenge of designing a non-fossil fuel based community that could survive a series of random events that occur during game play. The competitive drive to want to win and survive drove the students to fully utilize all their resources and think of creative ways to get energy, food, and clean water. All-in-all this made it a really effective tool for broad concepts like bioenergy and sustainability,” said Lesnik. Reflecting on the camp, Lesnik feels the best parts were the lively discussions that sprang up between students as they strategized on ways they could generate energy and build their communities. These types of discussions continued throughout the preparation and design of the communities and into the game play, where energy strategies within the teams were often changed in order to make sure other demands, like food and water, were met. With the beta testing of the game under its belt, OSU’s Bioenergy Education Initiative plans to take the game to the next level. They will be streamlining the game and developing a complete teaching module that includes a series of lectures and activities that could be used in middle and high school classrooms. If are interested in learning more about Planet 1061, please contact Adriene Koett-Cronn. For other K-12 bioenergy education resources, visit OSU BEI’s K-12 Bioenergy Education page or AHB’s page for K-12 educators.